If you'd love to live in Hawaii but can't afford it, check out these four great locations. Did you ever dream about moving to Hawaii or some South Sea island where you could lazily stroll the beach and spend moonlit evenings luxuriating in the warm breeze, all under gently swaying palm trees? And was that dream crushed when you found out how much it would cost? Well, despair no more. Here are four beautiful, unpretentious, easy-going beach locations that cost much, much less than Hawaii, and most likely much less than where you are now, as described by the more than 500 contributors to Best Places in the World to Retire. Bocas del Toro, Panama, is the only town of any size in what most people would think of as the Caribbean that has never had a hurricane. The reason is that the entire country of Panama is south of the Hurricane Belt. Think of it as a Caribbean lifestyle without an evacuation bag. Ann Michelle Wand, from Colorado, first came to Bocas del Toro 14 years ago. Since then, according to Wand, "it has developed tremendously from a surfer and backpacker destination to one of most desirable retirement destinations in the country." Wand had owned a vacation rental in Hawaii and sold it, because, according to Wand, "We were looking for something closer, with friendlier people and lower prices." Bocas del Toro fit the bill. "We loved the weather and the people and the quaint, funky town that reminded us of Key West in the 70s." 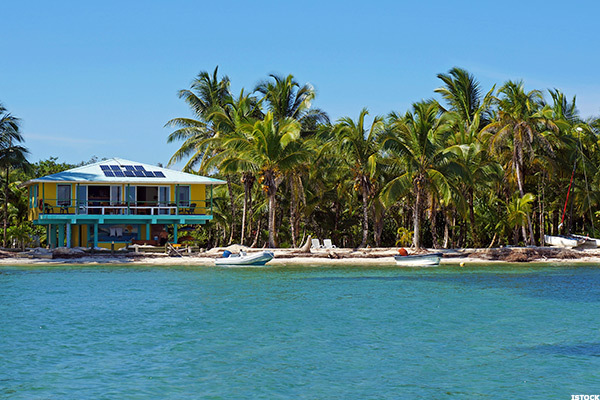 JB Seligman, former blue-water yacht captain, Texas cowboy and radio personality, told us "It's very much 'Caribbean' here, like a Jimmy Buffett song. The weather, the beach, and the whole vibe to Bocas del Toro is Caribbean." Seligman, his wife and friends often "jump on the boat and go to our favorite little spot on the other side of the island called 'the baby pool,' a sand bar about waist-deep, where we spend the afternoon. The water is crystal clear!" The biggest revelation to Seligman about life in Bocas del Toro was "You would be surprised how many 60- to 70-year-old surfers we have down here." Due to an offshore breeze that sweeps from the Caribbean through Nicaragua with great frequency, the waves around this Pacific town in the south of Nicaragua are among the best in the world for surfing. Add to this that San Juan del Sur is a favorite tourist and cruise ship destination, and you get a pretty good feel for this little town of about 8,000 people that not that long ago was a sleepy fishing village. Lance Moss, former Floridian who has lived in Nicaragua for 13 years and was one of the pioneers of popularizing surfing in the country, explained that there isn't any surfing in the actual bay of San Juan del Sur, because it is a protected harbor. The best surfing, according to Moss, is in Popoyo, about an hour and a half north of San Juan del Sur, about a mile down the beach from his home. Daniel Snider, whose father moved to Nicaragua, where Daniel was born and lives, told us "On $2,000 a month, a married couple could rent a nice house or an apartment close to the ocean and still have some money left over for shopping or going out once or twice a month. With $3,000 per month, they could rent a very nice house with an ocean view, have a maid, a gardener, and a personal driver." What you will not find, according to Snider, "is the East Coast mentality where it is all work and then a 2-week long vacation. 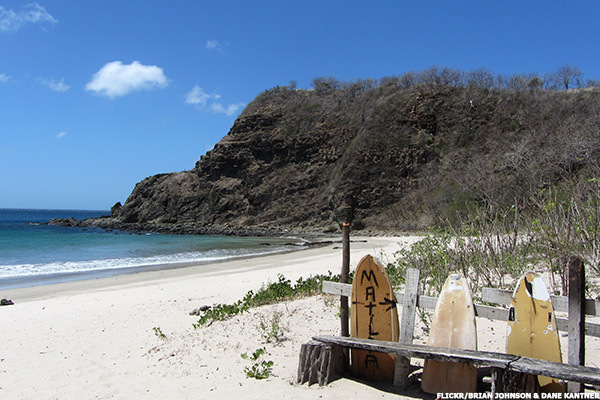 In San Juan del Sur it's one continuous vacation!" 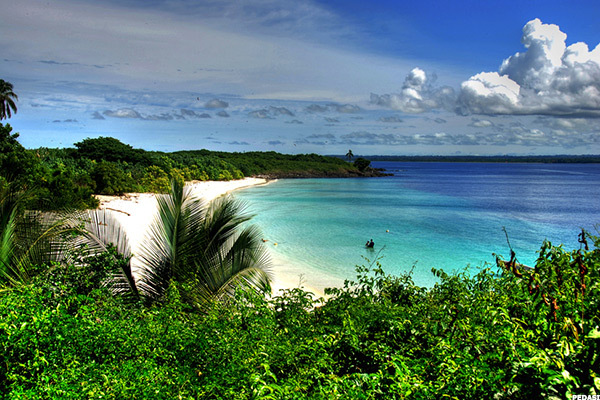 If you drive west from Panama City about 2 ½ hours, you will arrive at the beginning of the Azuero Peninsula. If you then make a left and drive down the coast for about another 2 hours, you'll reach Pedasi, a small town with spectacular ocean views and a rapidly expanding expat population. The feeling you get when you drive down the main road in Pedasi is one of a laid-back surfing town with a great lifestyle, isolated, but only an hour or so away from some good shopping and four and a half hours away from First World health care and other big-city amenities of Panama City. Native Panamanian Manuel Baruco told us, "Twenty to thirty years ago, the Azuero Peninsula was used almost exclusively for cattle." Now, Baruco tells us, Pedasi is developing as a tourist and expat destination because of the beauty of the area, the lifestyle, and the activities, including snorkeling, visiting nearby islands, and of course, surfing. To people from North America, the lifestyle is a throwback several generations. Baruco told us, "In Pedasi, most of the produce we buy is from carts. They are like moving markets where you can buy really fresh and flavorful items such as onions and tomatoes; not what you would find in a regular supermarket." There is a small but growing expat population that meets up at the local bars like Smiley's, where there are big-screen TVs showing U.S. sporting events. You've most likely heard of Cancun and other expat and tourist areas in the Yucatan Peninsula, in the state of Quintana Roo. The area we're going to describe is in the state that borders Quintana Roo just to the west, called the state of Yucatan. The state of Yucatan contains Merida, a modern colonial city of around 1 million people with first-rate universities, health care and shopping. 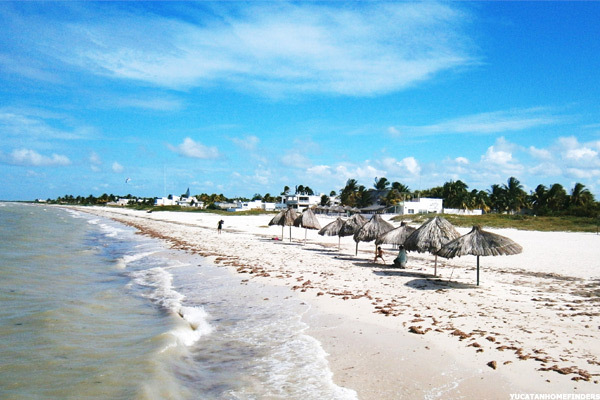 From Merida, you can drive 20 miles or so north to the nearest beach town of Progreso. You can also drive east 50 miles or so to the beach town of Celestún and less than that to beach towns northeast past Chicxulub. In between are the beach towns of Sisal, Chuburna and Chelem. What most of these areas have in common is that they are sparsely developed and little more than fishing villages. However, the combination of having First World conveniences and good yet inexpensive health care close by in Merida, coupled with very attractive housing prices right on this area on the Gulf of Mexico is causing increased interest in the area. "The beach areas of Merida are primed for rapid development," said Alfonso Galindo, a California businessman now living in Merida. "In 1970, the area we now call Cancun was not much more than jungle with a few dozen inhabitants. Now, it's a world-class tourist destination with $300 per night hotel rooms. There's no reason the beaches around Merida can't do the same." As of now, prices are low. Mitch Keenan, a realtor living in Yucatan formerly from Colorado told us, "I have a very nice four-bedroom, three-bathroom condo with 2,000 square feet of living space that looks out over the water in near Chicxulub for $99,000." According to Wade Yarchan, from Sarasota, Fla., "Anywhere in the Merida beach areas, $300,000 is going to buy a 2,500 to 3,000 square foot house. That same house in Florida on the Gulf of Mexico would cost you several million dollars." Canadian Gary De Spiegelaere lives in Celestún and says, "I can throw a rock underhand into the ocean from my property. I can sit on my terrace in the morning, have coffee, and maybe see one other person. It is very quiet, very private, and very beautiful."